I have eaten this thogayal in one of our friend's place and I wanted to try this. Here is the recipe I followed to make this. 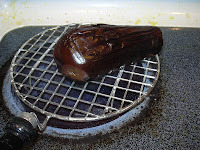 First cook brinjal on stove top or microwave it for 3 to 5 mts. The skin from brinjal will come out automatically. Take out the skin and mash the brinjal. 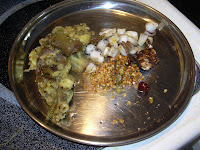 In the mean time, pre heat oil, fry mustard seeds, urad dhall, coconut and red chillies to golden brown adding a pinch of asafoetida powder to it. Let it cool. 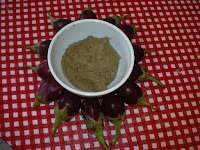 Grind it adding the mashed brinjal, required amount of salt and tamarind piece, into a fine paste. This can be eaten with white rice. It tastes really good. i too make this vidhya .. N it tastes really amazing ..
wow..sutta kathirikai thokayal and sutta applam gud combo.. last week only i prepared this..vidya you are having nice iyer's traditional recipe..